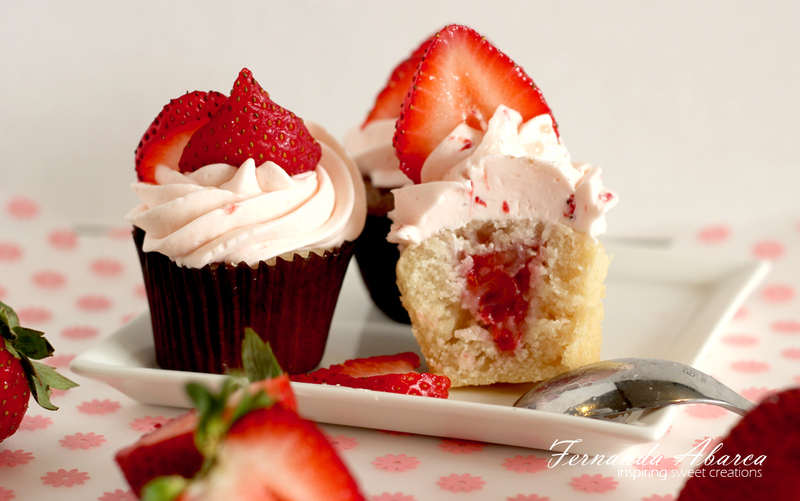 Today I want to share my most fabulously delicious strawberry buttercream. But before I do I want to give you some advice that I wish I had gotten when I started making buttercream. When it comes to buttercream the major ingredient is of course butter. The other ingredient is sugar. The more butter you add the heavier your frosting will be. The more sugar you add the sweeter it will be. Generally in order to get a buttercream that works, you will need 1 cup (2 sticks of unsalted butter). Then you add the amount of sugar you want, and if you want a lighter frosting than don’t forget to add that heavy cream or milk ( a little bit goes a long way here so don’t use more than 2 tbsp for 2 sticks of butter). If you do you will have a frosting that is way too soft. You want your buttercream light but you also want to be able to pipe it and make sure it holds its shape . If it gets too soft you can add more butter. If you decide to use this frosting on a cupcake like I did here, simply choose your favorite vanilla cupcake recipe and top it off with this scrumptious delight. You can even fill it with either homemade strawberry marmalade or you can grab some organic strawberry jam from the store if you don’t have time. This method also works wonderful in a layered cake. Also don’t forget that a cupcake/cake has to have balance. You don’t want your flavors all over the place. Nor do you want your frosting/fillings too sweet. Plan ahead and think about the cake or cupcake. Think about what flavors compliment each other and let that be your guide to planning. For this cupcake I knew that marmalade contains a lot of sugar, so I don’t want an overly sweet cake or buttercream. For me a rule of thumb always is keep the buttercream edible. That means I NEVER have buttercream that’s too sweet. I can’t stand that .. I’d rather have the sweet part come from a filling. 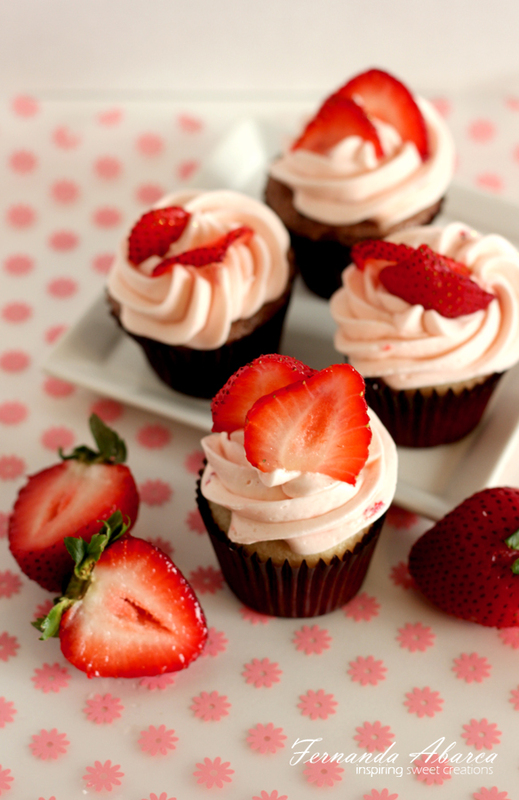 Here is the recipe for this buttercream. It started as an inspiration from this recipe, but I made delicious adjustments that really made it top-notch and not NEARLY as sweet!! ( In my book anyway). Thaw the berries (if frozen). Place berries in a food processor until pureed. You can run the puree through a sieve to remove the seeds or leave it. It is up to you. I leave it. Set the puree aside. In a large mixer bowl beat the butter until fluffy. Add the salt. Then the sugar slowly and beat until fully combined. Add the heavy cream and beat until fluffy. Add the vanilla and the (optional) dark rum. Mix well. Add one tablespoon of the puree. Beat well until incorporated. 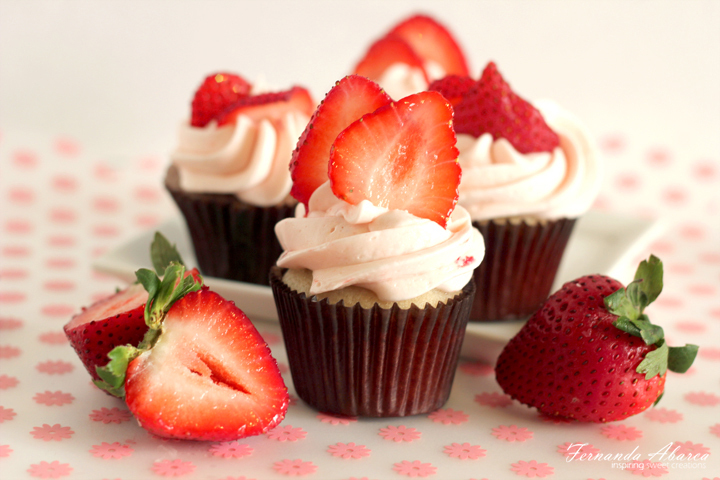 Use this frosting on a delicious strawberry cake or piped on vanilla or strawberry cupcakes. For more of Fernanda’s cake recipes including Lemonade and Oreo Cupcakes go to FernandaAbarcaCakes.com. And don’t forget to read Of Cupcakes and Dragons, our interview with Fernanda Abarca! This entry was posted in Eat, Uncategorized and tagged Fernanda Abarca, Fernanda Abarca Cakes, Strawberry Buttercream Recipe. Bookmark the permalink.